Members of Monaghan joined other local pipe bands in a pipe band flash mob organized by Glenfiddich Whisky to commemorate the 125th anniversary of Glenfiddich and the Statue of Liberty. Pictures from the shoot can be found here. The official video can be found here. The Annual Piper's Ball was held on Saturday June 23 in Gerritsen Beach, Brooklyn. To see photos of the event, click here. The Annual Piper's Ball will be held in Gerritsen Beach, Brooklyn on June 23 at 7pm. To order tickets, please contact Band Manager John Henderson. 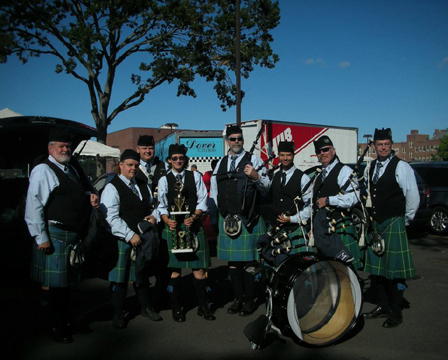 The Martin Duffy Memorial Pipe Band, Monaghan's Grade IV competition band, came off the 2011 season with a first place win in the medley competition at the Nassau Feis! We were thrilled to end the season with such a high note!